As i work round the clock to finish the Demo for the 2nd Act of The Dieselpunk Opera (and just fyi, the 3rd Act will be done by mid March. Release date for the Do will be the same as it was for the SO last year, beginning of May) i thought i’d follow through on my promise to put up the tracks that were made for the Steampunk Opera but then replaced. The first is the track made in place of what eventually became the Voodoopunks song. It was replaced for a whole bunch of reasons. 1: The 3rd Act dragged. A lot. 2: I came up with the idea of the subculture being Voodoopunks and decided to write a song that encapsulated that idea better. The other track is what was in place of Elysian Nights. I wrote at length about why i was deciding to replace it. So there you go. In the interest of the process being transparent here they are for those of you who care and missed it the first time. All right. Here is the video of the London workshop performance. Why is it important that i clarify that this is a small workshop performance in a small space, with a small budget and only 9 days of rehearsal? I get email from people who are excited about the album and dream of it as a theater show. And their vision is EPIC. Big and epic. Vast and grand. When they expect to see the show, that is what they expect to see. My vision is also big and epic. So for those who are expecting big and EPIC, i just want to let you know that we want big and epic too, but we must first get there. This is that first step. And the first step is a small workshop performance. In order to appreciate the challenge, i would ask you to imagine the album being staged in a room the size of your living room. How would you do it? This is how we did it. The sound is awful and there’s no way around that. You’ll just have to live. And videos of live theater are always pale reflections. But if you want to take a gander despite all that, have at it. This video was edited by Nadia Adame and i would once again thank the crew and cast. Tunnels run throughout the entirety of New Albion. While many parts of them are related to sewers and aqueduct systems, some sections exist as an entirely separate city beneath a city. For generations a tribe of albinos has lived and thrived underneath the city, trading more or less peacefully with the inhabitants above. The tribe survives by trading in gems and minerals they procure through their intimate knowledge of the New Albion underground, as well as tending archaic machines which operate deep beneath the city. Some of these machines perform tasks related to powering aspects of the city and some serve functions which no one living in the sunlight remembers. The tribe’s numbers have never been very large and in recent times have thinned significantly. it was thought for some time that they could not breed with the surface dwellers due to a modicum of Fae blood they possessed, this might in fact be pure fancy. Many parts of the New Albion underground are privy only to this tribe, although in they have seemed to not only welcome, but more or less merge with the influx of the Underground’s newest immigrants, the Voodoopunks, who, as of the time of the Dieselpunk Opera, have established a settlement in the tunnels. There are some of the Albino tribe who remain separate and plan to always do so. A faction led by three brothers lives and operates interdependently. They have grown quite powerful and their reach extends even up to the surface world. It was the brothers who discovered that some of the old power generators excrete a chrome colored dust that functions as drug when snorted, smoked, or even injected. The drug is mildly psychedelic and decently euphoric and over the past several years has become the second most popular drug in the above ground city amongst the war weary denizens. No one above ground knows exactly where the drug comes from and only a very few people know to procure it from the albino brothers. There are various interests desperate for this information including the red haired lad who runs a gang of feral youth (whose great grandfather was a dwarf). However hard this lad is trying to find out the source of this drug, and he is indeed trying hard, other powerful interests are competing also, including various mafias, the government and some rebel groups. It is a veritable Maltese Falcon chase and sooner or later someone will succeed. The three Albino brothers are well prepared for various contingencies. A number of kilometers north of the New Albion, years before the city was founded, there existed a settlement populated by a tribe of very fair skinned people, quite sensitive to sunlight. Their settlement was on the edges of a forest where Fae dwelled. Their relationship with their Faerie neighbors was for the most part decent and there were even rumors that they had in fact descended from the Fae, that years before a few young Fae had left to see the world of humans, had fornicated with them one night after shape shfting and their mostly human descendants had one day returned to settled outside the forest from which a few of their ancestors had come. The Tribe was warned of the coming of the Wager and a great City that would spring forth around it. Rumors as to whocould possibly knew of this and warn them of this abound, but the most insistant rumors claim Angels. Whether this is so or not is a discussion for another time. To avoid being subsumed in the great city, whose rise was inevitable, the tribe constructed a network of underground tunnels which could be sealed off and where they could hide when these raids came. Over time the tunnel system became so elaborate and well equipped that they abandoned the above ground settlement all together. For generations they flourished underground, becoming fully albino after some time. Their numbers were kept in check. There were even a few hidden passages, only able to be found by the truly adventurous and dedicated, which led to underground Faerie mounds deep in the forest and occasionally a youthful member of the tribe would cross over and never return, choosing to live amongst the Fae. While most of New Albion’s citizens concentrated on building in the sunlight, the Albinos began constructing an underground. They simply bought a property and began digging tunnels in the basement. Within a few generations they had already established a sizable underground network. As New Albion grew from a town into a city it began needing a properly developed sewer system, an aqueduct system not to mention methods of transporting good that were slightly more risque and outright illegal. The Albinos were clearly the people to talk to. They were the workforce that built most of the New Albion underground. There were of course numerous troubles. Plans for the underground network would be drawn up by surface dwellers without consulting the Albinos who would then utterly discard the plans and build according to their own preferences. This caused friction and bitter disagreements on occasion. 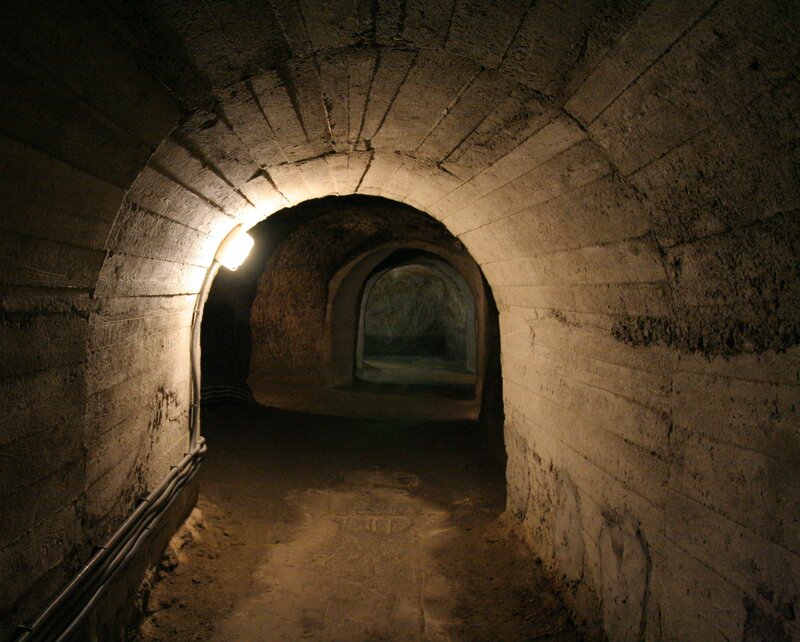 Mafias would try to use the tunnels for illegal cargo, nefarious acts, secret meeting places, which would often not be acceptable to the Albinos. The Albinos had to learn how to handle gang warfare. Over time however, their mastery of the underground combined with a new viciousness made the tunnels a place to be feared. If you crossed them, your disappearance underground could be achieved flawlessly, even while other men were standing right beside you. Entire raids would go down to the tunnels never to return. The Albinos raised pets, discarded by the above world who flourished in the sewers. New Albion maintenance teams knew that they would be left undisturbed to work on necessary parts of the sewer and plumbing systems, but would never venture to wander down unknown corridors. The Albinos are not actually so vicious as their reputation became over time, but the reputation serves them well and keeps them safe. Numerous denizens of New Albion have numerous stories of contact with the Albinos while underground and the stories can vary wildly. By the time of The Dieselpunk Opera, when the city above is in a civil war lasting years, the Albinos have achieved a lasting arrangement with the Red Haired Lad. Indeed one of the ways in which the Red Haired lad’s improbable little gang managed to succeed and flourish is that he was the first smuggler to actually reach a friendly agreement with the Albinos and thus is the only gang able to use the underground tunnels to transport all manners of contraband across the war torn city. The Voodoopunks found a home underground, and many have lived their for years after the brutal police crackdown following the riots. They and the Albinos coexist amicably, though how that came about is only a matter of speculation. Some Voodoopunks continue to live normal lives above ground but descend into the underground for the weekend rituals which have yielded very, very interesting results as will be shown during the 3rd Act of The Diesepunk Opera. Our first workshop has ended. Now we must say goodbye to the people we’ve been basically living with for the past 2 weeks. We’ve cleared out the space, had our final drinks, and off we scatter to the wind. We’ll keep some tabs on some of crew as they do other interesting things out there in Reality Land. 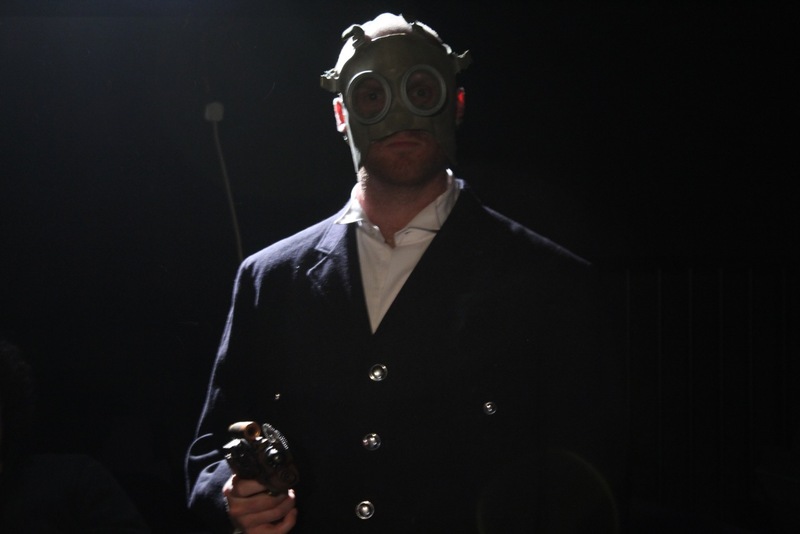 Our Steampunk Opera Motion Photography Dept is working round the clock to make a video of the show we can shop around to producers and interested parties. We’ve had great feedback and very positive responses. It seems fairly certain that there will be a future for the show one way or the other. I am aware that some of you fine folks out there will want to see some video. I will post some video. I’m not sure exactly what, but i must warn you, it is going to take some time. The video must be uploaded, converted, compressed, edited… it’s gonna take a bit. I’m going to fly home (SLEEP) and i’ll be back in a day or so with a post dedicated to the Russian fan base out there who sent a representative to the show with gifts and tidings and who deserve their own post of thanks and gratitude. Tonight shall be the final night and i believe, our finest moment. Thank you to everybody who has come and everyone who has been following this here on the blog. We’ve had an absolute blast and i hope this has given an interesting insight into what it’s like building a theater show from the ground up. I hope there will be another series of posts soon enough detailing the next stage, but for now we’re going to prepare for our last and best night. We’ll be videotaping tonight, and when i eventually post footage it will from tonight that you see. To all who are coming, i look forward to seeing you, please feel free to introduce yourselves and share your thoughts about what you see during the talk back, and i hope you enjoy what shall be our last and by far finest hour yet. Here are some pics, cause pics are fun. See you tonight! Well folks, we have arrived. I don’t have new pictures for you today or anything, i may have a couple over the next few days, but chances are the next few days will be pretty light blog wise since we shall otherwise be engaged in performance. Even though it’s only a “workshop”, a lot of talented people have been working very, very hard to make this an enthralling and engaging experience, something far better than simply the staged reading of the show this could otherwise have been. I believe we have succeeded in actually making a magical little moment of theater, that presents not only the possibilities The Steampunk Opera has as a larger future show, but as an enjoyable evening of story and music in its own right. Our actors, Lauren Osborn, Kate Young, Oliver Marsh and Mikey Shearer are top notch and turning in razor sharp performances. 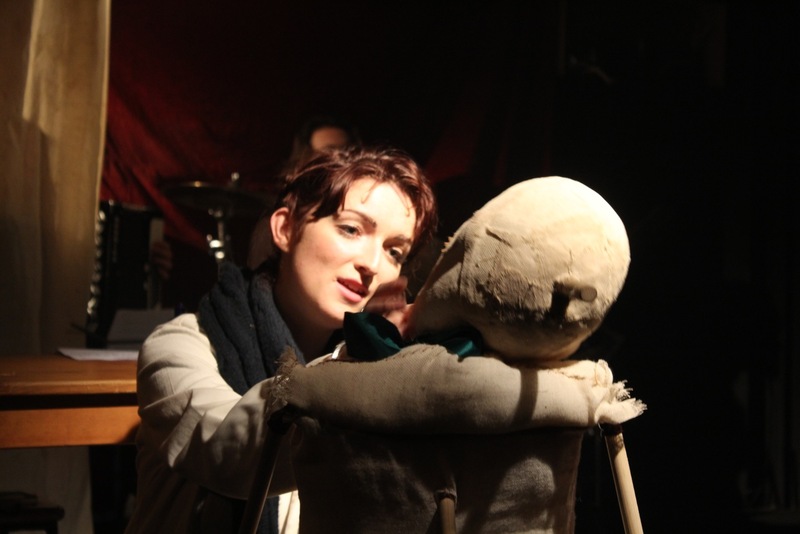 Our puppeteers Faith Brandon and Joni-Rae Carrack have brought Jasper eerily to life. Wait’ll you see our dancer Jorge Crecis dancing some bits by choreographer Nadia Adame. It’s killer. The band, MIljen Aljinovic, Tommie Ross and Ben Assiter, playing at probably the lowest volume they have or will ever play in their lives (no mics on the singers!) are killing it. Our designer Lily Arnold and lighting designer Zoe Spurr have created a magic little world in a black box to lose yourself in for 90 minutes. Jennifer Harding, our stage manager is literally the one holding this all togetherwith the help of production manager Tom Lee, and of course, all of this was taken from the aether and put forth upon the material plane by director Mark Swetz. Workshop or not, we hope we have created a magical little experience. The time has come to open the doors and let the seats fill up. Here is our beginning and let’s just hope the future is on its way. Thanks to everyone involved and of course my big thanks to everyone who has supported this endeavour out there in internet land. I do so hope one day we shall come to your town. In the meantime, here is the single step that begins the journey. Well we got in the space today. And Just as advertised it is SMALL. it’s a black box all right. The issues this presented are all ones we’ve been waiting for. Working out performer placement, musician placement and orchestration given the ease with which the band can drown out the singers was of course of major concern, although none of it unexpected. I’ve had some back up plans i place for days now, such as canning the band during all instances where the Narrator sings and having her always accompanied by only acoustic guitar. This does work and one must remember, in a workshop performance like this, you are looking to show off the story, characters, lyrics and melodies. As much as i would like full orchestration, if the lyrics and story are lost, it is all in vain and the show’s future dims. So we are doing our best to accomodate. And one more day ticks away. Tomorrow is tech. Performers run through in the afternoon and full personnel run through occurs in the evening. We’ll hope all the adjustments made today stick in the bands’ heads. 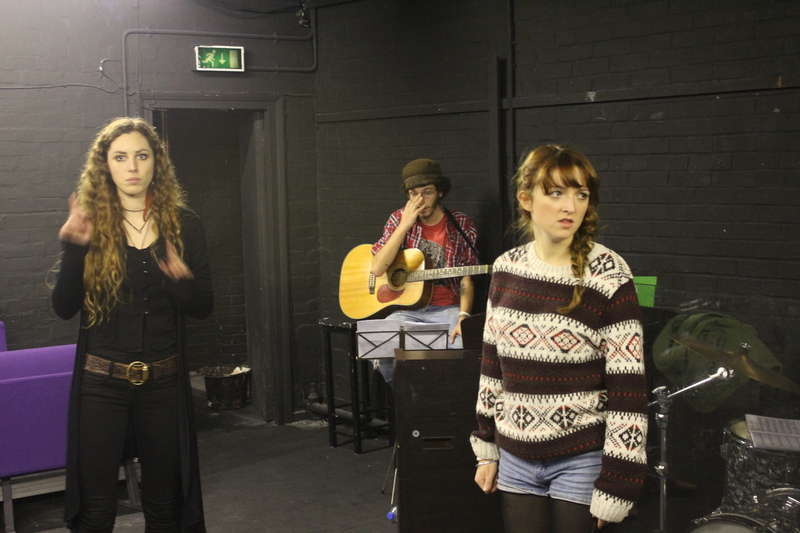 The performers should be in good shape and truth told, they seem to be given the insanely short rehearsal process. I’m throwing up a few videos here which not only show a bit of the day, but illustrate the auditory problems. You can here how the singers cannot be heard in some cases and how with gutted instrumentation the problem is corrected.